There's a place on earth that even the most seasoned travellers consider a privilege to visit. This is Druk Yul, Bhutan, the Land of thunder Dragon. Tucked away from the modern world, perched high on the mighty Himalayan range, the kingdom of Bhutan has defied globalization and chosen to remain a hidden paradise. Bhutan has been declared as a global hotspot for its pristine environment and rich biodiversity. It is marked by raw natural beauty where the dense foliage changes dramatically as the sub . tropical jungles at sea level merge into a fertile temperate zone and rises up to the great northern glaciers. This pristine environment is home to exotic wildlife and is a last refuge for endangered species like the Black Necked Crane, the Blue Sheep & the Golden Langur. At Bhutan you can connect yourself with a hidden Himalayan Culture. 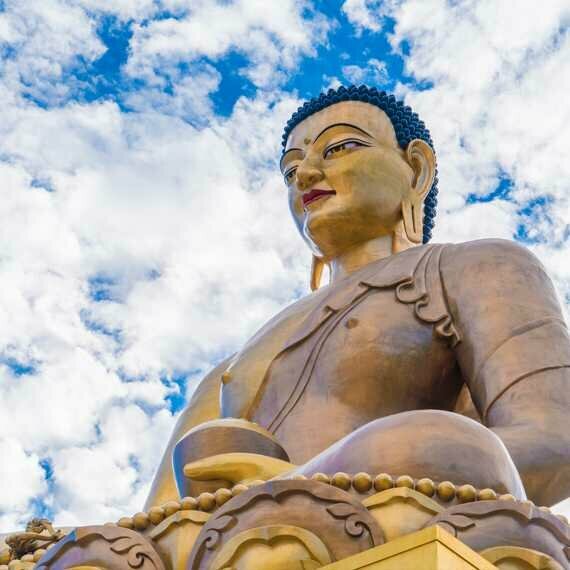 Be inspired by the Bhutanese People, Buddhism and the poetry of the landscape. Where Happiness is the main goal in life. Even the mandate of the modern Bhutanese state is Gross national Happiness. Bhutan is also known as an Abode of Gods. Bhutan is the last bastion of Vajrayana Buddhism. The sacred monasteries that sit precariously on sheer cliffs, the fluttering prayer flags that line the high ridges, the red robed monks who chant through the day and night give this Kingdom an aura that comes from another time.